CFO 5 Liters Commercial Hot Chocolate Machine Beverage Dispenser Keep hot beverages ready to serve anytime and anywhere with the hot chocolate dispenser. Depending on how many guests you'll be serving. Although these units are not designed to make hot chocolate, they're perfect for keeping your pre-mixed beverages piping hot and ready to serve. Our hot chocolate dispensers have convenient features and easy controls. The clear design of the bowl helps merchandise your hot cocoa, while the rotating paddle within the bowl keeps the drink well blended for a consistent taste. The adjustable thermostat features easy-to-read markings so you can hold your hot chocolate in the ideal temperature range between 160-185 degrees Fahrenheit. Eliminate spills and mess with the no-clog faucet and drip tray. Guests will easily be able to serve themselves with the large faucet handle. Not only does the front rod on the faucet prevent clogging, but it can also be adjusted depending on the thickness of your hot drinks. The hot chocolate dispensers come with a lid, cleaning brush, and a NEMA 5-15P plug. These dispensers make holding and dispensing hot cocoa and other pre-prepared hot drinks easy for your operation. 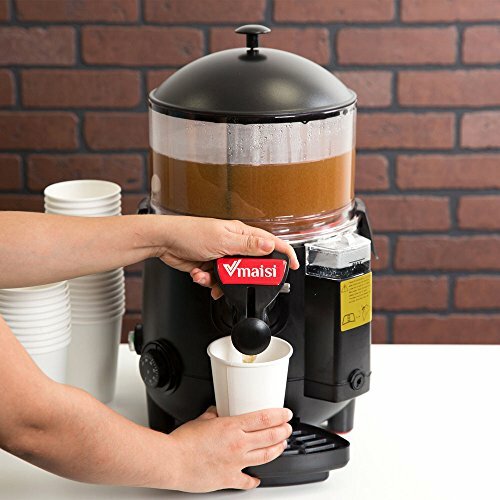 Keep your delicious pre-mixed beverages piping hot and ready to serve with the vmaisi Hot Chocolate dispenser! while the rotating paddle within the bowl keeps the drink well blended for a consistent taste. Adjustable Thermostat: The easy-to-read thermostat lets you adjust the temperature from 160 to 185 degrees Fahrenheit.